MJ has allowed me to commondere her blog today, as I have a different perspective on the whole Stepmom arrangement. She & Clark are fortunate enough to have full custody. We are working towards that end, but currently face a geographic challenge. My four year old step-son, “Little Prince” (henceforth known as LP) and his dragon Mom-ster live in a different state. It is far from our ideal for the situation (it is not even within spitting distance of our ideal arrangement). Right now, however, it is how things are, and being good grownups, we are making the best of it. Certain Grownups in the World of Modern Families (we all know at least one…), Hear Me! Please. PLEASE at least PRETEND to be polite to one another in front of the little ones. I know that inside you are also a scared kid who doesn’t know how to navigate the situation. Perhaps you are even a mad kid who is upset at the unfairness of the situation (I have news for you: Life is unfair. Deal with it.). Be that as it may, when you act like that kid on the playground who doesn’t want to be friends with anyone, your kid(s) will notice. On the first night of our most recent visit with LP, we played tag in the courtyard of a nearby shopping center as we waited for his Momster to come fetch him. A variation of Calvin-ball, the rules kept changing as the littlest member of our tribe decided whether or not he wanted to be “it.” During one of my many turns as the dastardly ‘it,’ he kept me at bay by deftly keeping a stand of foliage between us. I couldn’t help but chuckle to myself, not only at his resourcefulness, but at just how much it reminded me of a scene that played out earlier that day. 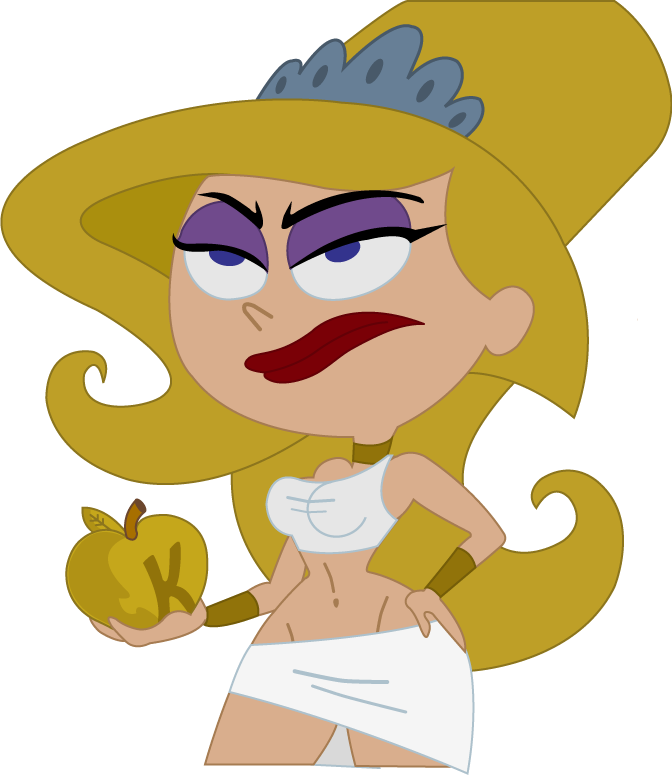 Eris, as in Godess of War & Chaos, not the dwarf planet. In the two years Charming and I have been together, I have given his ex wide berth – mostly at her insistence, that she never have to lay eyes on me. Lets call her “Eris”. She has communicated this request colorfully. and often… Until recently, it was an easy preference to take into account. On the last trip, however, LP started asking why I needed to be pre-dropped off or post-picked-up. We were running out of plausible explanations. We didn’t really want to start fibbing just to preserve his mom’s reputation; nor did we want to badmouth her. So, we did what any loving, mature couple do in the face of adversity: we held hands through it. In this instance, we were literally standing side by side as she pulled into the parking lot of the park she’d picked for hand-offs. There was much debate before we deployed this tactic. Better for me to sit in the car? Better for me to hide behind a tree a ways off until she’d driven off? Perhaps I could twitch my nose like the witch she thinks me and dematerialize for her portion of the drop-off? These may have been more palatable options for her, but they missed completely the example we are trying to be. More than (almost) anything, we want LP to grow up with a model of what grownup love really looks like. The kind where the sight of your beloved entering a room still makes your heart skip a beat. Where hand-holding and affection is the norm & laughter not on the endangered species list. Where you can also talk about serious and unpleasant subjects reasonably, where you support and listen to one another. Actively. No matter what. In short we want him to aspire to our interaction instead of living in a world where texting takes the place of real communication, and affection is viewed as something only given to the kids of the world, which is how I came face to face with her that first morning. “Hi Eris, I’m Natasha”. My initial impression of her as she scuttled to the other side of the car at what should have been our first official meeting was her posture, or, rather, lack thereof. Dressed in mismatched shades of black, shoulders hunched forward, she kept her head down so that long strands of unruly dishwater blonde obscured her eyes as she shuffled crabwise along the car, keeping it between us so as to avoid shaking my outstretched hand. As she rounded the fender, she said – more to the rearview mirror than to me, “I know who you are.”Thus ended our first official exchange. While it allowed me to finally see for myself what I’d so far only experienced secondhand. She is an expert at not standing still long enough for anyone to actually talk to her face to face. She sports a pair of earbuds made “necessary” by near-constant “conference calls” that may well be surgically implanted for the amount of time they are in place. And she makes absolutely no attempt to hide her disgust for people she doesn’t care for. I would trade that insight for an amicable situation in a heartbeat. For someone whose self-professed stance is to act only in LP’s best interest, her behavior confounds me. That she managed to escalate the discordant relationship while as the same time toeing a letter of the law interpretation of “getting along” would have been an great achievement, if only it hadn’t come at LP’s expense. It was saddest thing I heard that trip. I know everyone’s mom gave them a variation of “if you don’t have anything nice to say, don’t say anything at all.” But just because you aren’t saying something verbally out loud doesn’t mean you aren’t communicating your utter disdain for a situation. After two years of it your sweet, perceptive child has figured out you have an ax to grind, and he is trying like crazy to be the one to somehow fix it for you. So. Grownups in this situation? Please. For the sake of the kids, please sharpen your weapons in private. From time to time, we all need safe venting places to rant and rave and generally act out. Find yours. Do your misbehaving there. Perhaps then you’ll be able to put a mask of politeness when you have to deal with or facilitate a relationship with your kid’s other parent. After all, one of the first things we learned way back when was the beauty of pretending, right? As a middle school teacher and the product of a blended family (hence an expert 🙂 ) I agree, the number one, most important, top priority in your child’s life is for the parents to get along. One thing that some angry adults do not realize is that almost all kids take responsibility for what is happening between the parents. My mom and dad had a great relationship after their divorce; they NEVER bad mouthed each other, and my dad would even come and stay with us (and my mom and step-dad). I, of course, turned out perfect 🙂 Meanwhile, my step-dad’s ex-wife was CRAZY (constantly using the kids to get her way, even threatening to kill them – CRAZY). Needless to say, they have some issues (one is in a half-way house). Regardless of how my step-brother’s lives turned out, I just feel so bad that we were in the exact same situation, but mine was not filled with anger, hatred, and fear. I was inspired by my mother’s love for her husband, I think it’s why I married such a great guy. It breaks my heart when my students talk about the anger in their households or when I see my friends who are excellent step-moms being battered by angry ex-wives, and it makes me realize how amazing my mom and dad are/were. I dont think people realize how “main stream” set- parents are or how this all effects kids, long after they are no longer kids ! But we do hope to bring it into light – “steps” no longer have to be second place. We can have so much more/positive influence !!! As an “evil” step-parent myself, I see so much truth in your blog post. The kids do see and recognize who is being the adult and who is being the child in these instances. For the sake of the children – act like an adult!! They will thank you for it later. One thing “adults” underestimate – how smart kids really are!